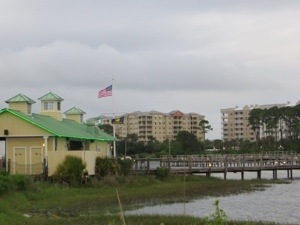 When last I wrote, it was raining in St. Augustine (Thursday evening). 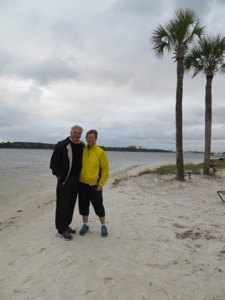 Don and I had planned to relax on the beach for a few days after my ride, to decompress and reconnect. When we woke up on Friday morning, it was still raining, and the weatherman said 8 inches had fallen in 48 hours, roads were flooded, and more rain was forecast. We decided to head west, hoping to find sunshine. We drove to Tallahassee, and it was still raining. 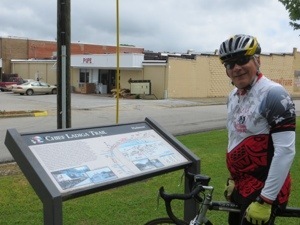 We stopped in Marianna to pick up a pillow I had left on the bike tour. 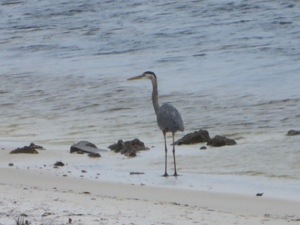 Then we decided to head toward the Gulf beaches. 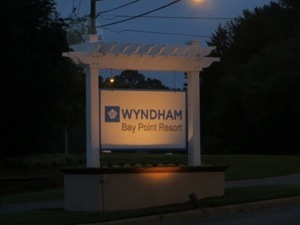 Friday night we stayed at the Wyndham Bay Point Resort in Panama City Beach, no rain, but also no sun. 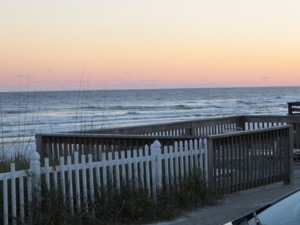 Sure enough, Saturday morning, it was raining in Panama City and Thunder at the Beach, a motorcycle rally, was scheduled – time to move on. 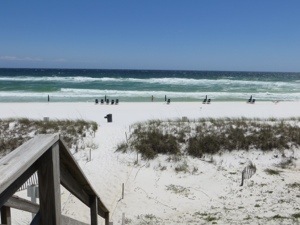 We continued west, finding sunshine at South Walton Beach. 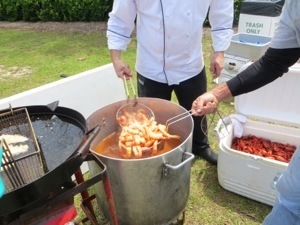 We passed a crawfish and shrimp boil, in support of the local fire and police, and decided to have early lunch. The sun was shining, and while it wasn’t actually hot, we decided to find a place to stay. 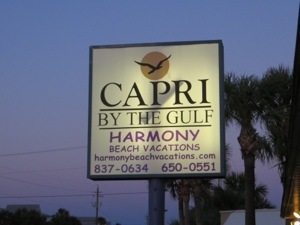 We lucked into an efficiency at the Capri by the Gulf, 10 steps from the walkway to the beach, and within the sound of the surf. 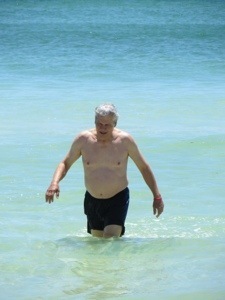 Don enjoyed swimming, I relaxed in the sun. 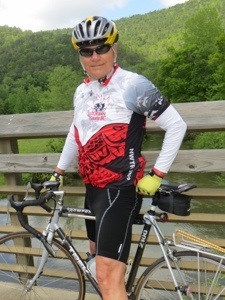 Sunday we went for a bike ride, total 38 miles – no photos as it started to rain as we headed home, and wind picked up to 25 mph. 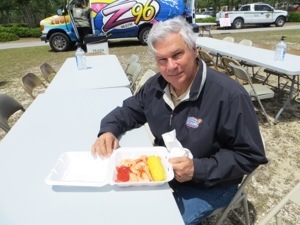 With more stiff winds in the forecast, we elected to head north, via Pensacola, where we had lunch. 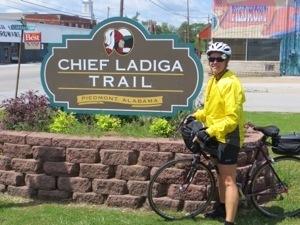 We spent Monday night in Gadsden, AL, after driving through torrential rain in Birmingham. 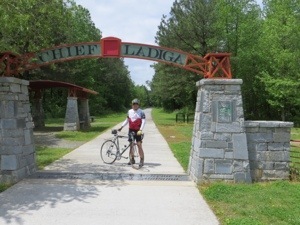 We were hoping for no rain on Tuesday, so we could ride part of the Chief Ladiga Trail in northeast Alabama. 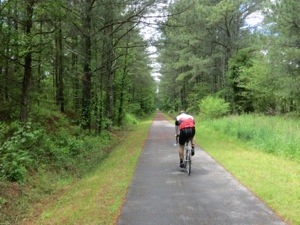 We were in luck; the gray clouds did not produce rain, we did have some sunshine, and rode 53 miles. 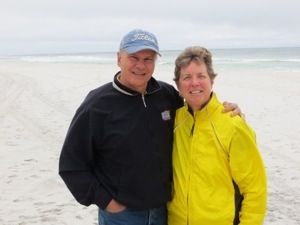 Tomorrow (Wednesday), no more Dolly-gagging, we will arrive back in Carmel, IN. 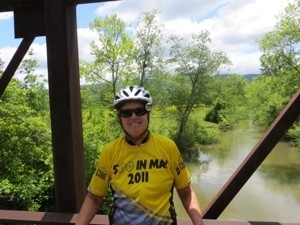 I miss my biking sisters; I’m slowly adjusting to an unstructured schedule, but I will not soon forget my 58 days across the Southern Tier. Adventure of the life time! Don – thank you for supporting Dolly!!! My Danish friends and I have two words for you——Well Done !!! Looking forward to seeing you both. Sorry about the rain but so proud of you. 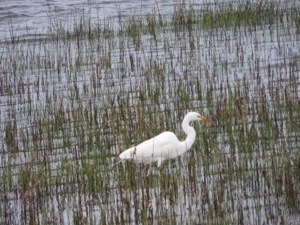 Thank you for the wonderful blog of your great journey. It certainly brought back many happy memories of the ST trip of 2007. Hope to read about more of your adventures in the future. 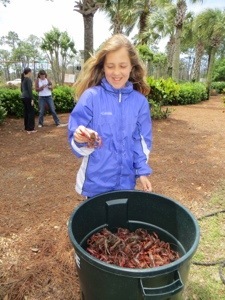 Know that the re-entry blahs will fade but your great memories won’t! Glad you got home and GOT IN….congrats on finishing and achieving your dream! Can’t believe after all your bike riding you bike rode some more with Don to relax!! A true passion! Glad you made it all the way! !